If you’re a teacher in any of the schools in the Ormeau vicinity and you see a few yawning youngsters in your class today, give them a by-ball. In fact, send for a basin and fill it with iced water so they can revive their feet. Chances are they were doing some foot-stamping and toe-pointing at the Waterfront Hall last night, and folks, it was A BLAST. 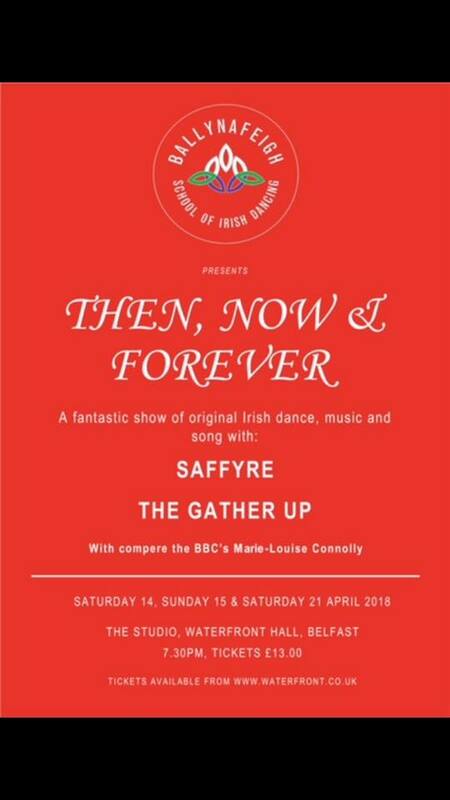 Ballynafeigh School of Irish Dancing gave us a mighty showcase of local talent in their production ‘Then, Now & Forever’, taking daily life on the Ormeau as their inspiration, tracing the years from the Second World War until now. With Marie-Louise Connolly, the BBC NI Health Correspondent acting as compère, the vignettes fused together seamlessly to show the vibrancy of our local area. The performance illustrated how life may have changed in the last eighty years but what remains the same are the bonds of family life, encased within a strong and supportive community. The packed theatre at the Waterfront bore testimony to this community, as did the fact that members of the six-piece band ‘The Gather Up’ who played throughout, and two of the singers who make-up ‘Saffyre’ had daughters in the production. What was most evident was that the chorographers knew how to put together a show and kept the audience entranced with their inventiveness and creativity. Despite my acidity, I’m surprisingly sentimental, and welled up a few times, most notably when the band took down the tempo to play a slow melodic rendition of ‘Pack up your Troubles’. During this sequence, when the tiniest of the Junior Dancers took to the stage as child evacuees, complete with brown labels, the ‘awwww’-factor went off the scale. Then, when the khaki-clad soldiers returned from war to the glorious Technicolor of the street, with the women and children waving coloured flags of every hue, the joyful and carnival-esque scene had the audience whooping and clapping with delight. There was a glorious nod to Dancing at Lughnasa in the sequence inspired by laundry, when dancers in aprons and headscarves whirled like dervishes; spinning white sheets as though buffeted by the breeze. Here was the mundane infused with magic; and since laundry forms the back-drop to most of my life as a mother of two with a sporty husband, I was glad to see it imbued with the significance it merits. 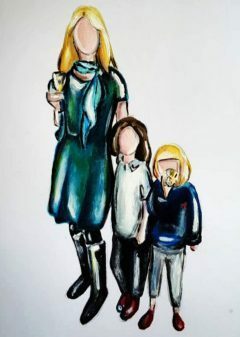 Act Two took us to the present and showed scenes with which every parent on the Ormeau could identify; from the frenzied school run to the Bredagh matches and the well-deserved evenings’ out when mums sparkle in their sequins and dance away their cares. ‘The Gather Up’ proved here that they don’t simply excel at Irish Traditional music, playing ‘Nine-to-Five’ and other contemporary tunes with a flair that had the audience dancing in their seats. The West End may watch out too, for if soloist Anna Smith doesn’t end up taking to the stage there I’ll be amazed. Was there a dry eye as she sang ‘Bring Him Home?’ I for one was glad I remembered my tissues. The quotidian is not celebrated enough, but this show draws our attention to tireless work that takes place every day to foster talent and nurture relationships. Watching the younger dancers master their reels and their slip jigs, stepping and swinging with the more experienced dancers was a joy to witness. This weekend, what with the backdrop of war in Syria and the ever-worrying world climate, I felt anxious and sad. But as the band sang the words ‘what’s the use in the worrying’ I felt a peacefulness descend. Life is uncertain, and frankly, quite terrifying. This is why we must cherish each moment and learn to let ourselves go every so often, immersing ourselves in the beauty of dance and music. We must also be grateful to those who champion it. Dancers of Ballynafeigh and your teachers, I salute you. You warmed my sour little heart tonight. Thank you, you were all luminous. Really nice read. The “considerating your acidity” quote made me chuckle out load and spit a little bit of my vegan burrito out. God I sound old, and wannabe middle class and I’m not even vegan! That sounded like a fantastic night. Wish I had known it was on. Previous Previous post: You don’t want to know what’s in the wood shed. Next Next post: SWB isn’t sorry.